New Delhi: Amid a raging debate on RTI, Union law minister Salman Khurshid has made it clear that there is no proposal for a “relook" at the Act but noted that not only the government but the judiciary too had experienced “difficulties" because of it. “We are proud of RTI. We are pleased that we gave RTI to this country. Even if it causes inconvenience to this country to an extent, we will bear that inconvenience. 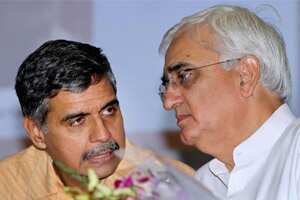 On whether the RTI would be revisited, Khurshid said, “there is no proposal to relook at the Act". He went on to add, “Today, we are only absorbing the experience of the RTI and now whether after a period, looking at the experience, looking at the demands, looking at the consensus that can emerge, we can bring about any changes or not is something that is futuristic. It is something which I cannot say today." The law minister, however, ruled out making fundamental changes in the legislation. “If you say that we’ll make any fundamental changes in the RTI, the answer is no. We are proud of RTI," he told PTI in an interview recently. Queried whether some more exemptions like the one granted to the CBI could be brought into the Act, the lawyer-turned- politician noted, “No legislation is perfect."